If you receive a "Samples Missing" error when loading an instrument from VDL, there are a couple things that could be happening - both of which are easy to fix. To start, quit any host programs like Sibelius or Finale, then launch Kontakt in standalone mode. • In the Kontakt browser column, click the ‘cog’ icon next to your library and select Open Containing Folder. This will open the location on your computer where your library is stored. • Check the contents of your library folder to confirm that they look complete. Important: Here’s an article that illustrates what a properly populated VDL Library Folder should look like. Be sure to check the file sizes as well. If you have any incomplete .nkx files, that may be the source of the error. • If your library folder appears correct and in tact, proceed to step 2. If it’s incomplete (or if file sizes are too small), delete your library folder then reinstall it using the instructions that came with your library. Note: we recommend you take this opportunity to update to the latest version of the library if you haven’t already. • In the Kontakt browser, click the ‘cog’ icon next to your library and select Remove Library. This will remove your library from Kontakt. Don’t worry - this is just temporary. • Assuming you have a fully populated library folder on your computer, add it to Kontakt by clicking the Add Library button. • At this point, Kontakt will ask you to navigate to the location on your hard drive where you’ve stored your library folder. Once you’ve located that folder, highlight it and click Choose. You should now see your library appear in the Kontakt browser. 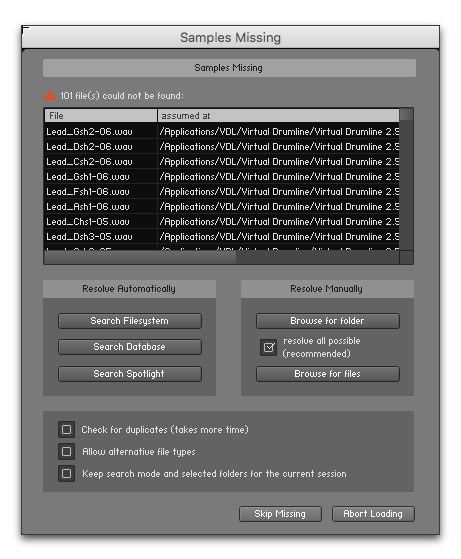 • Load an instrument and confirm the Samples Missing error no longer appears.